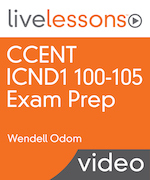 The new “CCENT ICND1 100-105 Exam Prep LiveLessons” product – or CCENT Exam Prep LiveLessons for short, or maybe even CCENT EPL for shorter – divides the technology content by exam domain. This is the first post describing some of that technology, with this one focused on the first domain of the ICND1 100-105 exam: Network Fundamentals. First, let me give you a bit of background. Skip ahead to the “For Instance… Subnetting Terms” heading if you know all about exam topics. That is, if you bothered to take the time to meticulously look at the exam topics for both the ICND1 100-105 and ICND2 200-105 exams, and compared that combined list to the exam topics to the CCNA 200-125 exam topics, you’d find the same topics. Cisco subdivides the exam topics for each certification exam into domains. The term domain has a specific meaning in the learning world, but for us, it’s just the first level of subdividing and organizing the list of topics. The Cisco exam topics documents details the topics on the exams in outline form. Those outlines list two or three more outline levels (depending on the exam) inside each domain. If you’ve not read the exam topics directly from Cisco’s web site, it’s worth doing so. 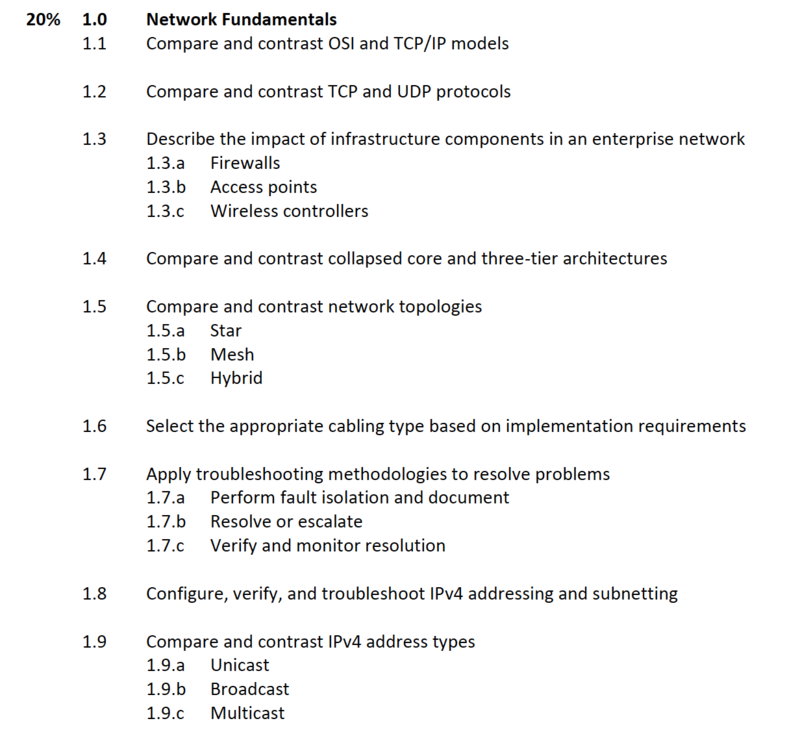 Cisco lists 14 separate exam topics within the first domain of the ICND1 100-105 exam topics document (numbered 1.1 through 1.14). That is, the domain is numbered 1.0, with the next-level items in the outline being numbers 1.1 through 1.14. Within each exam topic numbered 1.1 – 1.14, some of those topics have subtopics listed – but not all. In other words, in some cases there’s another level in the outline, and in some cases, there is not. Here’s a sample, with two adjacent exam topics in the list, one with sub-topics, one without. a list of miscellaneous topics that do not fit in the other five domains. These miscellaneous topics are also fundamental (that is, more basic coverage). Of course, IPv4 and IPv6 addressing are fundamental, but they go beyond the basics, requiring a fair amount of work to master. The largest of the three modules in the CCENT ICND1 Exam Prep LiveLessons product (by video time) holds the Common Mistakes videos. The goal of those videos is to help you understand the most common mistakes made on the exam, so you can of course avoid making those same mistakes on the exam. To give you a sense for the Common Mistake videos from that product, let me describe one of the issues that is discussed in one of those videos: subnetting and addressing terminology. Loose Terms: Many terms are used to mean multiple ideas; many ideas can be referenced with multiple terms. For instance, consider the following figure, taken from one of the PPT slides used to create the CCENT EPL common mistake video. It shows how a set of eight terms on the left. In casual conversation, all eight terms could be used to refer to a subnet (a subdivision of a classful network), or be used to refer to the entire classful network. Then it would be up to you to figure out, in context, what the specific meaning was, or whether the specific meaning mattered or not. One of the Common Mistakes videos in the new CCENT EPL product discusses these terms, the mistakes in using those terms, plus several other subnetting terms (almost 30 in total in that one video). That’s just for some perspective on the product. You will find three other sample CCENT EPL Common Mistake videos at the product web site if you’d like to take a look. I’ll give you a few more examples of topics in the CCENT EPL video product over the coming weeks! Switch Forwarding Question: Destination MAC Only?